Having an office made of glass doors and walls is great in terms of natural light and aesthetics. You do, however, run into some issues regarding privacy. Etched vinyl can be applied onto the exterior and interior glass doors or windows to create a frosted glass effect without actually having the glass treated. This is a more affordable option and you will not have to permanently alter the windows and doors which is helpful if you are renting the space. In a lot of offices, you might see a full door or window covered top to bottom with etched vinyl. This does give you the most privacy, but there are a lot of different ways to use etched vinyl. 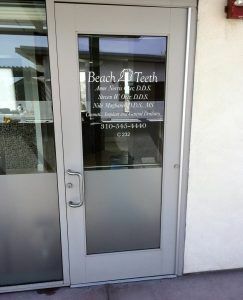 Beach Teeth is a cosmetic dentistry office in Manhattan Beach, California. Last summer we applied etched vinyl to the bottom 3 ft. of their front windows. The windows and doors were mostly glass so this helped create a little more privacy without completely blocking out the windows. We also added some company information onto the front door in white vinyl and cut out their logo from white vinyl for a few of the windows. They were so happy with the results that this year they contacted us again to do work on the rest of the windows. We covered an additional 10 windows with the same style of etched vinyl with their logo, except this time more windows had their logo. Having your logo repeated and displayed around the building create brand recognition while helping customers find your location easily. Aside from covering your whole window or part of the window with just etched vinyl, we can also cut your logo from the vinyl and apply it onto a glass door so you can’t see in, but your logo is still displayed. We’ve also cut logos and images out of the vinyl, which is great if you want it to be a little more subtle. We’ve used this method before to add a little more personality to a glass conference room. Etched vinyl isn’t just for glass, we also use etched vinyl on a lot of acrylic backer lobby signs to create a subtle background behind the company logo. Etched vinyl can virtually be used on any clear or translucent vinyl to create a frosted glass effect. 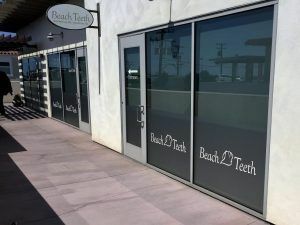 Whether you are trying to create more privacy within your office, or you want to give your lobby sign more character, etched vinyl is a great choice for all businesses. If you already have some ideas of adding etched vinyl to the interior decor of your office, you can request a quote here.